On an October 2012 West Coast trip this friendly smile and a $6 toll welcomed us to San Francisco via the Golden Gate Bridge. Husband Walter and I enjoy the mix of old and new experiences on our visits to San Francisco. We have walked the 1.7 miles across the bridge and back several times. Our most memorable Golden Gate Bridge walk was July 4, 2002, after 9/11. That day there was beautiful weather and a spirit of goodwill and fellowship that broke out into friendly conversations among strangers as we hiked in the sunshine, 220 feet above the water. This trip we didn’t attempt that trek. We only had Friday afternoon and evening and the entire day Saturday. Although I have made great strides in my stroke recovery (Sorry, but I couldn’t resist that punny cliche! ), I was not quite confident about walking that distance with no benches for resting. 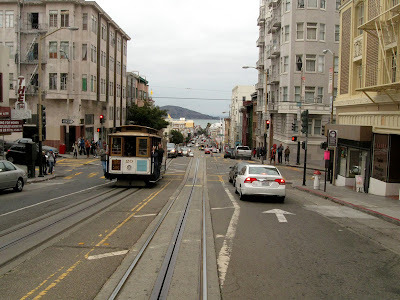 But riding the famous San Francisco cable cars was a challenge that I was determined to face. 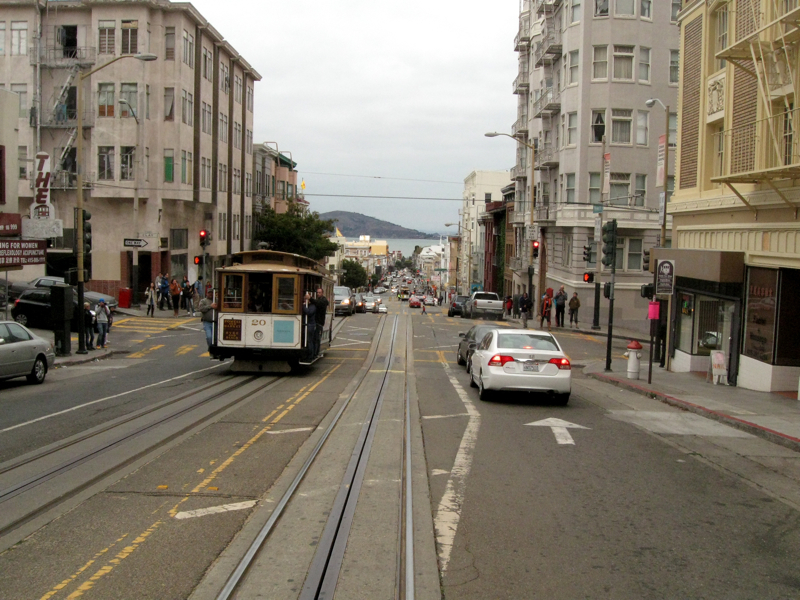 Every time we visit San Francisco, riding the cable cars – a lot – is at the top of our to do list. No matter how many times we have visited, we still act like first-time tourists in our excitement about the historic mode of transportation. Except we go first to the Hallidie Plaza that is near the Powell Street terminus at Market Street. 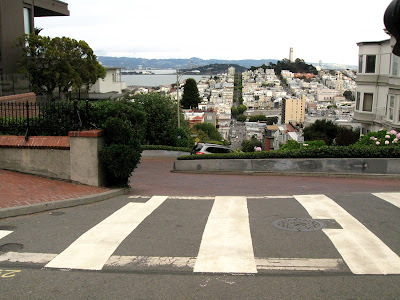 The plaza recognizes San Franciscan Andrew Smith Hallidie’s development of the iconic solution for transporting people through the City’s steep streets. The cable car system he developed and tested in 1873 is the same cable-driven system in operation beneath the streets of San Francisco today. But history is not what prompts our stop at Hallidie Plaza. We buy our 3-day MUNI passports at the Visitor Information Center on the plaza’s lower level. 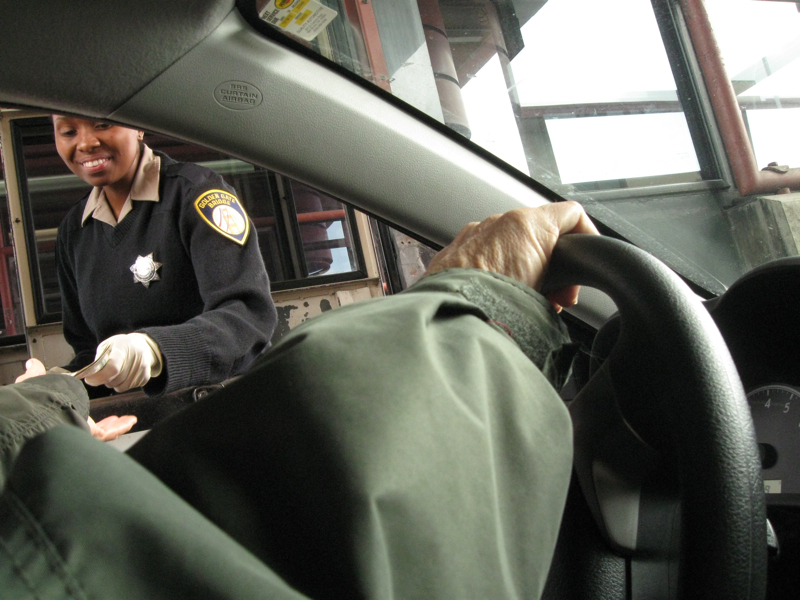 There are other locations that sell the passports, but the visitor center also offers lots of useful information and helpful assistance by real-live human beings. The three-day passes are about $22 and cover unlimited rides on cable cars, historic streetcars and MUNI buses. We get our money’s worth and more with the passports. There is also a more expensive City Pass that includes admission to selected attractions, but the passport is a better fit for how we like to explore San Francisco. The cable car operators and conductors were extremely alert and helpful about my physical disabilities, easing the way in my first post-stroke attempts to board and exit a cable car. Using one of the sturdy metal grab bars, I was able to pull myself up onto the steps to board the car. Disembarking down the steps was a little more difficult, but Hubby Walter is a great “spotter” in situations that push the margins of comfort or safety set by my degree of progress in regaining movement, strength and balance at any given time. We passed the top of Lombard Street's famous “crooked section” with Telegraph Hill and Coit Tower visible in the distance. The crooked, brick-paved, one-way section of Lombard Street between Hyde and Leavenworth features tight switchbacks that ease the way for vehicles on the 27% grade. 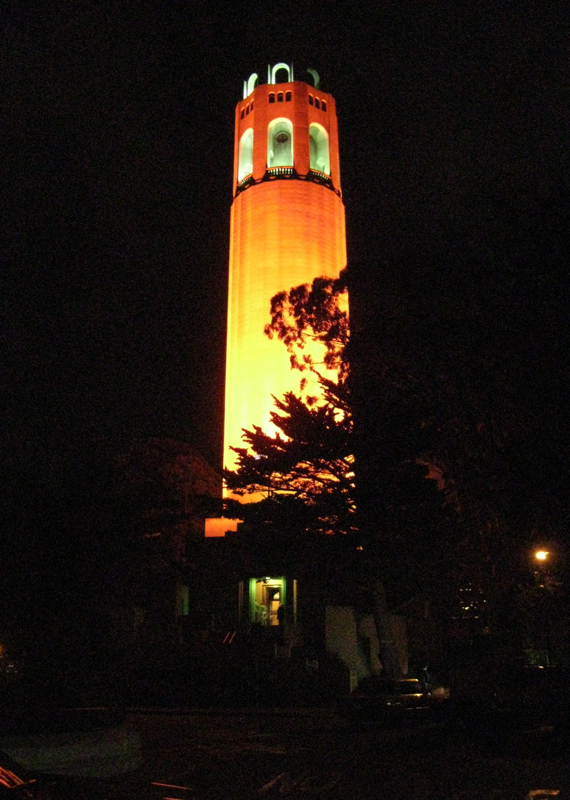 Hubby also treated me to a night-time photo safari, starting with Coit Tower. By our last stop at Twin Peaks, I had exhausted my energy reserves. I chose to enjoy the view from the comfort of our rental car. Walter’s photographic efforts were interrupted as we both watched the efforts of an industrious raccoon that was raiding a trash can. Walter posted about our night-time excursion here. How wonderful! I have never been and always wanted to go. How often do you go? I bet they have awesome food, too! Ginny, Hubby says we have been to San Francisco more than 20 times. Started in the early 70s. Love your photos. I lived in SF from Sept to Dec 1968 right after college. Worked at UCSF Med Center during that time as a med secretary. I remember the parties my roommate hosted in our apt on Clayton Street. We always had a good time. I think the last time hubby and I visited SF was more than 10 years ago. Time for another visit! 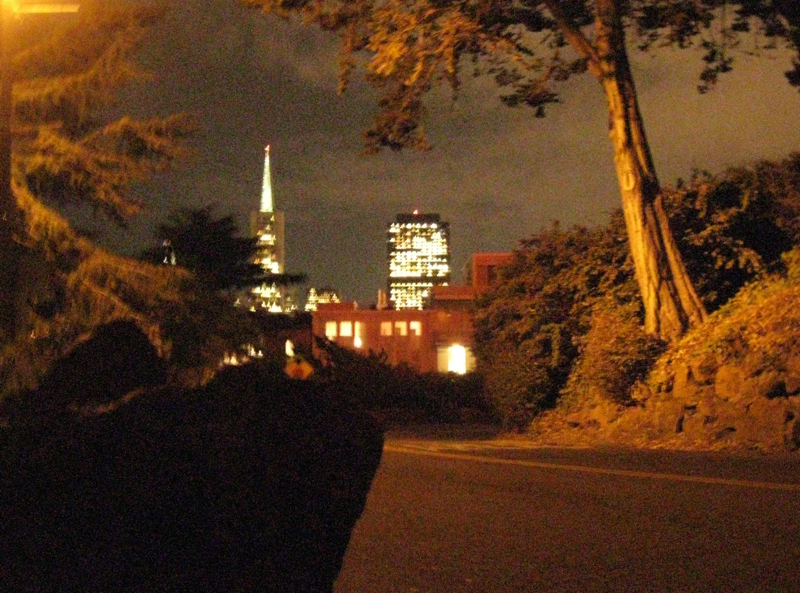 Ahhhh, I left my heart in San Francisco. Great photos and I think your pass was a terrific deal. Money well spent. Remember next time you are out our way we will have to get together.